Creating new habits and transforming bad habits into good ones can be very beneficial to achieving wellness and happiness. Habits become hard to break because they are deeply wired by repetition in our brains. And when you add pleasure to them-like you have with drugs, alcohol, or food, for example-the pleasure centers of the midbrain get pinged, and continue to fire long after the habits stop, creating the cravings that individuals struggle with. Habits are also patterns of behavior and it’s the breaking of these patterns that are key to breaking the habits themselves. 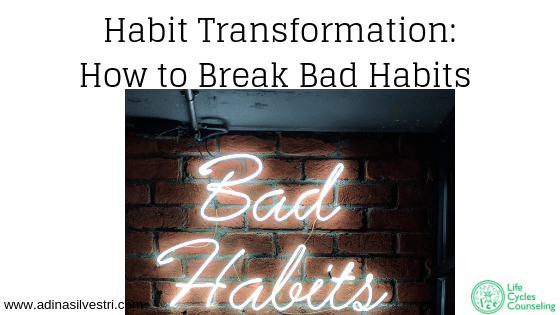 If you are at a point where you would like to transform your bad habits into good ones, there are some important things you need to know before starting the process of change. In order to change your habits, you need to first learn the key ingredients that makes a habit a habit and what you need to initiate change. It’s a helpful reminder to think about the formula for what makes a habit, a habit. This formula includes the cue which is the triggering event or situation, the routine which is the behavior triggered from the cue, and the reward which is the satisfaction and outcome that results from the behavior. These are steps are the key to creating a habit or transforming an old habit into a new habit. It is the blueprint into creating different habits unique to each individual. A key ingredient in habit transformation is starting simple and easy. Habits often stem from goals that we have for ourselves. Often when we are trying to create new habits based off of new goals we have set for ourselves, those goals tend to be massive and not very realistic. The key to habit transformation is knowing to start small, simple, and easy. Setting the bar very low and starting small makes it easier for you to be successful in transforming an old habit into a new habit by the daily routines you engage in to condition yourself into forming that new habit. It also allows you to slowly and steadily build up from there in order to achieve your bigger goals. Another key ingredient is knowing who you are and who you want to be. Having a clear concept of who you want to be can also help you clarify the goals you have for yourself. It can also help you decide if a particular habit you want to change is worth it which will directly relate to how motivated you are to make the change. Knowing yourself can help you set the pace for how you go about transforming those habits. This includes knowing if you are the type of person that doesn’t like to be bound by schedules and deadlines or if you are the type of person who prefers to be flexible and do things in your own time and at your own pace. Habit transformation relies on understanding the formula of the habit loop that creates a habit, self awareness and knowing who you are (including your limits and strengths), clarifying your goals into very specific ones, and remembering that to be the most successful with transforming your habits is to start small and work up to the big changes. These are the key ingredients to habit transformation that can set you up on the path to success. If you’ve done the best you can and are still struggling, consider seeking professional help. While not all habits are created equally, (in terms of their consequences) the goal is the same, namely YOU taking action and being more deliberate than routinized. Let us know what you think by commenting below or contact us here! What have you learned when trying to transform a habit? If you enjoyed this blog, click here for more!